A traditional jinky winger who skins his man before getting to the byline to whip in the perfect ball, laces outwards, for the bustling number nine to head into the onion bag ? Or … the more modern version who’s probably left-footed and likes to cut inside to exploit the space “between the lines” ? Surely, every blade of grass is between the lines, isn’t it ? Formation is key when it comes to defining a role as specific as this one, and as such our man may find himself tracking back one minute, before surging forward the next, only to then be tucking in to help out in the engine room when the ball’s on the other side of the pitch, before switching to a proper outside right position as the team launches another attack, this time down his flank. Historically, the best players have always been able to play in more than one role – you only need to look at the other Top 4 nominees to see the proof – and in truth, the formation doesn’t matter with a cast list as stellar as the chaps lining up for this particular leading role in the team. Often accused as being lazy fancy dans, right wingers can win you games on their own and some of the world’s best have played in the position. Still, enough pre-amble … let’s get on with it, shall we ? My Top 4 Right midfielders … Ever. 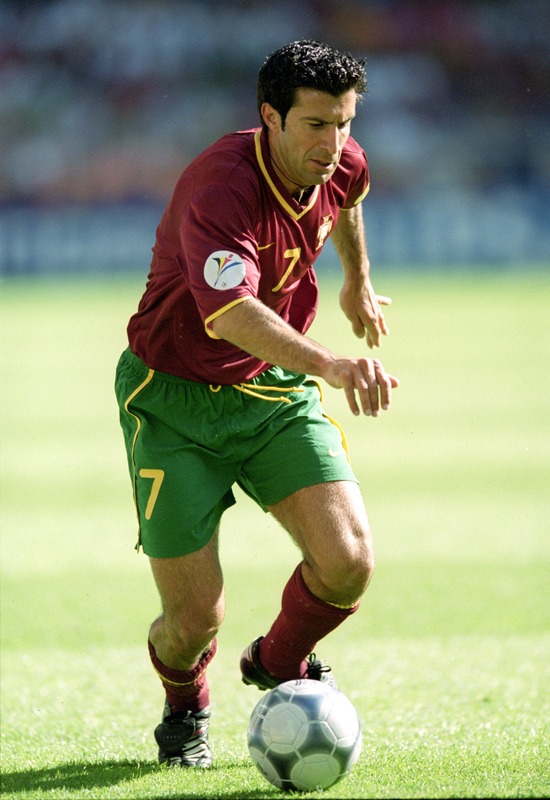 Luis Figo emerged along with the likes of Paulo Sousa, Rui Costa and Jao Pinto as part of Portugal’s “Golden Generation” team that won the World Youth Championship in 1991. He made his debut for the senior national team that same year, aged 18, and went on to captain the side in a glorious 127-cap career, in the process becoming the most celebrated Portuguese international since Eusebio in the 60s. Despite hosting and reaching the final of Euro 2004, they failed to actually win any silverware in the end at senior level, though they did reach the World Cup semi-finals two years later, a very creditable result for such a small nation. Blessed with incredible technique and the ability to use both feet, Figo could play on either wing, or as a central play-maker and pulled the strings for most teams that he played for. His club career started out at Sporting Lisbon, before he made the inevitable move to Spain and Barcelona, like so many good players plucked from the supply chain that is Portuguese football. But Figo wasn’t just good: he was world-class and the step up only made him an even bigger star, perhaps the best player at Barca at the time. Commanding a fee of just over £2m – which seems ludicrous now – he took the club to a UEFA Cup-Winners’ Cup win in 1997, and two back-to-back championships in ’97 and ’98. Despite being a crowd favourite for five years, Figo made the controversial switch to Real Madrid in 2000, this time for the princely sum of £37m, still the 5th highest fee of all time. Heralding the age of the Galacticos for Real, he went on to win the league in 2001 and 2003, while also squeezing in a Champions League title in 2002. Supposedly moving to Inter to “wind down” his career, he ended up winning a further four consecutive Serie A titles there, as well as a few domestic cups before finally hanging up his boots in 2009 after more than 800 first class appearances and over 100 goals. One of the most gifted footballers of all time, Jair Ventura Filho holds one of the coolest records in world football history: not only was he a key member of the sublime Brazil ’70 side, but he also scored in every single match during the tournament, joining an exclusive 3-man club in the process (Uruguay international Alcides Ghiggia and France’s Juste Fontaine being the other two). 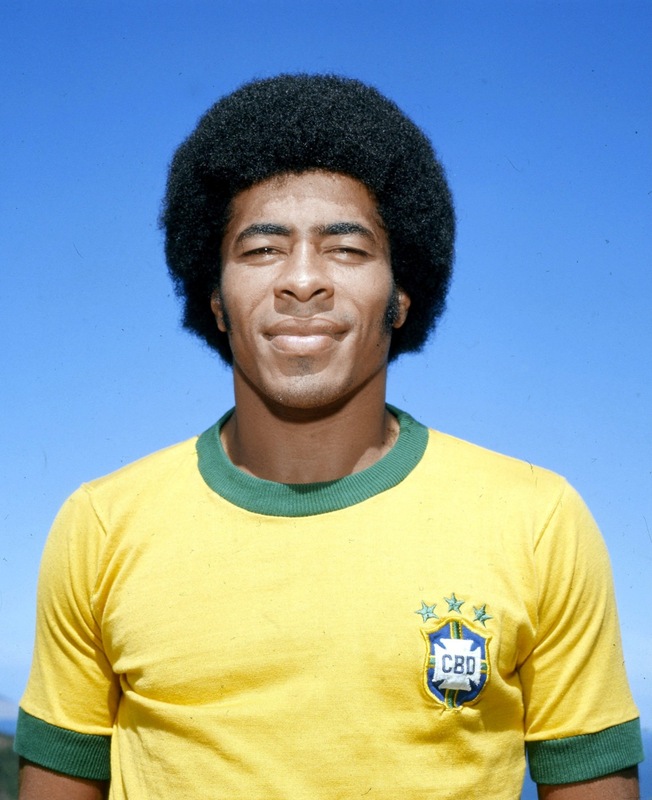 With the ability to play anywhere across the attack, Jairzinho typically started matches on the right wing for Brazil, but often drifted around, sometimes swapping with Pele, sometimes with Tostao and sometimes switching flanks with Rivelino, that golden side were actually playing total football four years before the Dutch … they just didn’t know it. Having idolised Garrincha as a boy, Jairzinho eventually lined up with him during the 1966 tournament, but was forced to the left wing to accommodate The Little Bird. With Pele effectively kicked out of the series during the group stage and the attack slightly unbalanced by the tactical arrangement, Jairzinho and Brazil found themselves down and out before really making a mark in England, and it wasn’t until he played in his favoured position on the right flank that he began to flourish at international level. With a World Cup Finals record of 9 goals in 16 matches, he actually outscored many of the greatest forwards in the history of the game. When FIFA named their 100 greatest players of the 20th century, Jairzinho was listed at 27, one place ahead of Zinedine Zidane. He also had a very cool afro. I know at the start of this process I said I wouldn’t be picking on reputation alone, but some rules are made to be broken and some players simply merit greater recognition than others. With that in mind, I can think of no-one more deserving than football’s original knight, Sir Stanley Matthews. He remains the only player to have the honour bestowed upon him while still playing, and although it wasn’t actually given to him during an a match, you could imagine him retaining the ball during the ceremony had it taken place that way. Matthews was also the first winner of both the European Footballer of the Year and the Football Writers’ Association Footballer of the Year awards. Like many others in these Top 4s, he set records and was a true pioneer of the game, so much so that he was an early “cultural” icon when the sport’s only utilisation of the term until then was to describe a half-decent left foot. Above all else, what I find most unbelievable about the man is that he played professional football until 1970. I’ll write that again: 1-9-7-0. Not bad for a man who made his debut for Stoke in 1932. I’ll write that again: 1-9-3-2. I knew he’d played well into his fifties, but I assumed that was sometime around the early 1960s. The perfect advert for absenteeism as a vegetarian teetotaller, he is by far the oldest player ever to play in England’s top football division and that includes goalkeepers. Even now, with improved training facilities, fitness technology, better nutrition and conditioning, there are very few outfield players who make it to even 36 or 37 in the top division. Ryan Giggs, Paolo Maldini and Javier Zanetti are a few that come to mind, but they’ve all been exceptionally dedicated athletes with almost flawless injury records. To have done it an age where it was virtually compulsory to drink, smoke and eat lard for breakfast, and as a player before and after WWII with rationing and a much lower standard of living, simply beggars belief. There’s not much footage in existence now, but a lot more than most of his contemporaries because back then he was box office gold . 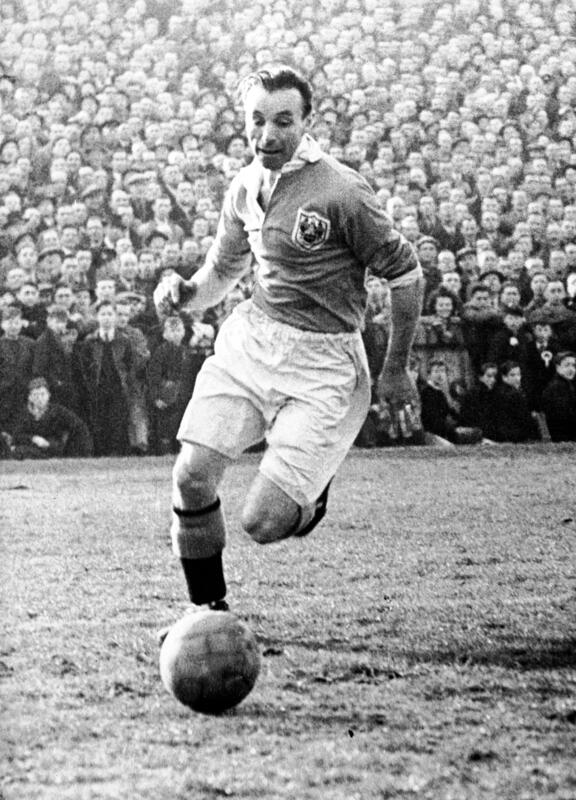 Of course, the great man will always be known for “The Matthews Final” of 1953 as his Blackpool team trailed but came back to sensationally beat Bolton Wanderers in a 4-3 thriller at Wembley, in which Stan Mortensen scored a hat-trick. I’ll write that again: The Matthews Final. Mortensen hat-trick. Let’s face it, the man was a freak, but I mean that in the nicest possible way. Lester Piggott, George Foreman and Martina Navratilova all enjoyed long and illustrious careers, but Matthews eclipsed them all and everyone else who was ever described as a professional athlete in any discipline. What price his talent and longevity these days if the likes of David Bentley can command a £15m+ transfer fee ? 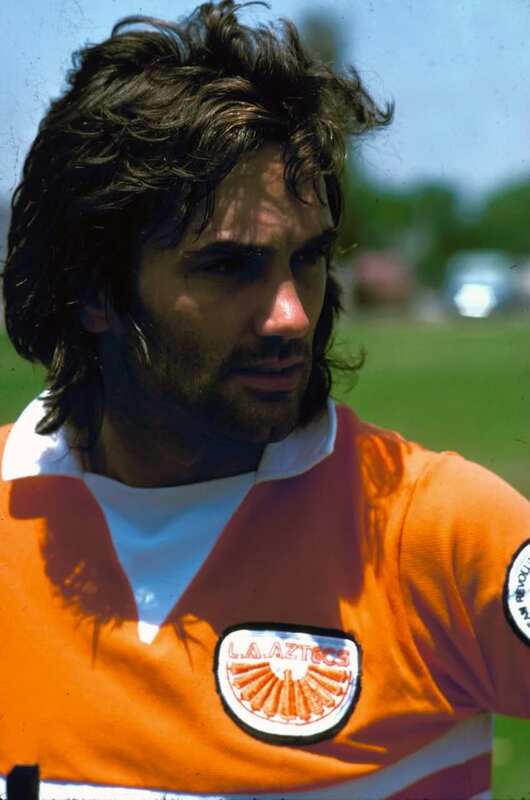 George Best transcended the game and became a cultural icon in his own right both in Europe and around the world, blazing a trail that not even the likes of Maradona, Beckham or either of the Ronaldos could dream of, while his ability with a football surpasses them all, barring the great Argentinian. With the ability to play anywhere across the midfield or up front as a playmaker or a poacher, Best was the ultimate offensive footballer – in more ways than one, some would say. But forget the lewd stories and the tabloid headlines: remember the player. Remember the skill. Remember the pace, power and technique. Remember the goals. Remember the tricks and flicks. Remember his prodigious work-rate. He was no fancy dan who grew disinterested when he didn’t have the ball: he was a team player par excellence. 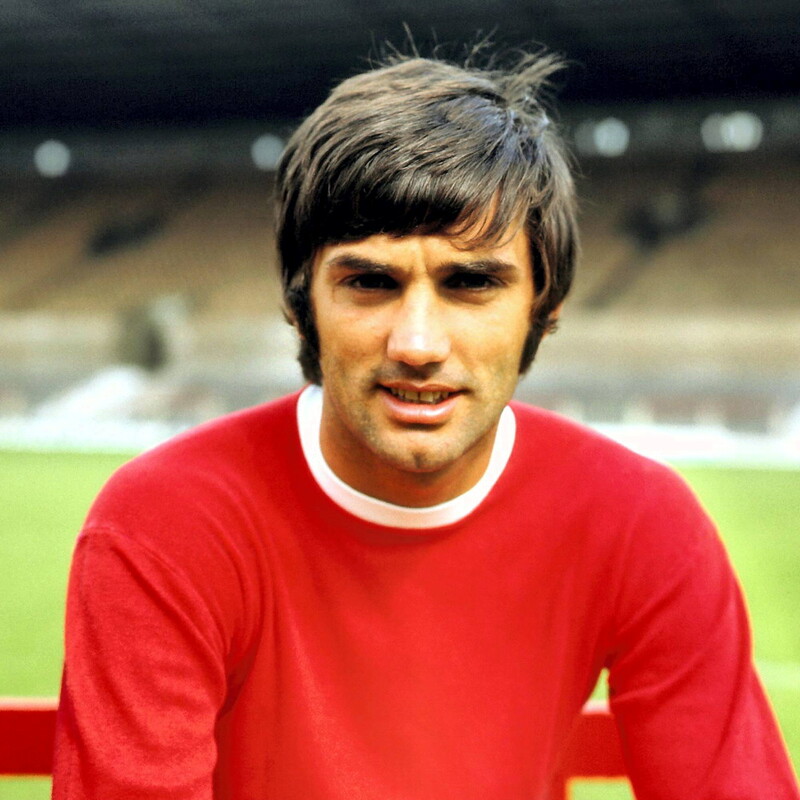 Voted European Footballer of the Year following Manchester United’s European Cup victory in 1968, he had first burst onto the world stage two years earlier when he scored twice against Benfica in the same tournament, causing the Portuguese media to dub him The Fifth Beatle. Still at the tender age of 19, he outshone such luminary team-mates as the great Bobby Charlton and Denis Law as the club became the first from England to lift the trophy, with Best scoring in the final as United beat the same team 4-1 in the final at Wembley. Prolific both as a scorer and a provider, he was not just a scorer of great goals but also a great goal-scorer in his own right, finishing as joint-top marksman in that historic ’68 season with 28 league goals (with Ron Davies of Southampton). Detractors will say he threw it all away and that he didn’t win enough, but fans of the great man would argue that he was at United ten years too late as the team was in decline by the time he’d fully established himself in the first eleven. He definitely should have won more silverware, having to settle for “just” the two league trophies and that solitary European Cup with them, but then again he upped and left for the bright lights of America in time for things to get interesting over there. In terms of lifestyle and personal experience, I’m sure he had as good a time as he would have playing for any of the top sides in Europe and the man himself certainly never talked of regret. It’s a shame he didn’t play at a World Cup, but there have been plenty of other examples of great players not making onto the greatest of football stages (Duncan Edwards, Alfredo Di Stefano, Liam Brady, Bernd Schuster, Ian Rush and Ryan Giggs to name but a few). Many of the game’s greatest talents have walked the thin line between genius and madness, with the likes of Paul Gascoigne, Diego Maradona, Eric Cantona and Zinedine Zidane often jumping two-footed from one side to the other, and again Best proved to be the forerunner of them all. Not all creative talents can be as balanced as Pele or Platini. If you take any walk of life and any period of history, most of the pioneering high-achievers have been, shall we say, somewhat unbalanced. This should not detract us from their efforts, be it with a football, a guitar, a paintbrush or on the stage. 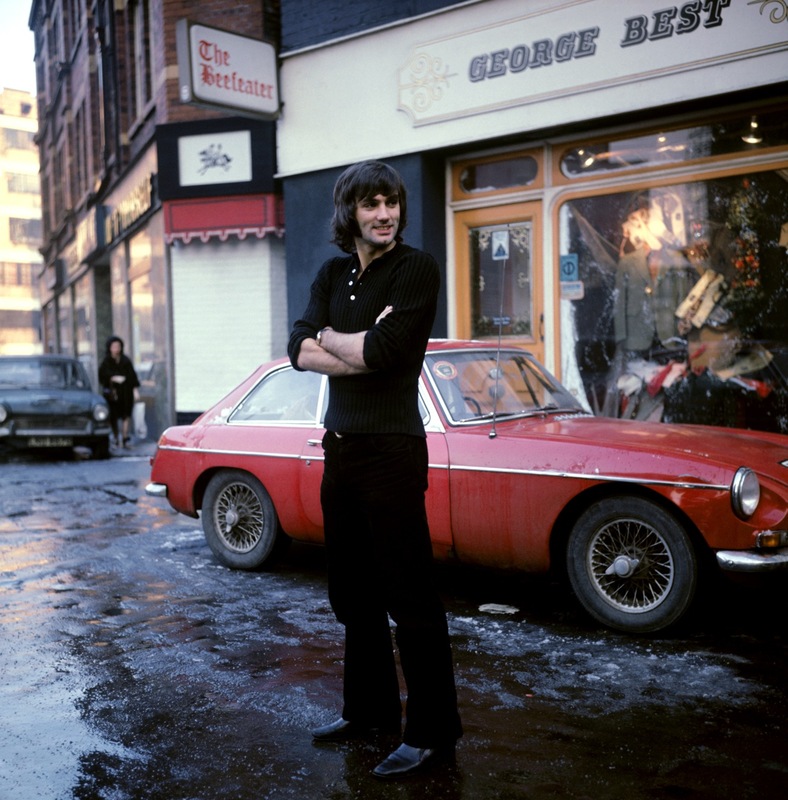 The world would certainly have been a duller place without them all, but especially without George Best. Honourable mentions: Garrincha, Cristiano Ronaldo, Ronaldinho, Jimmy Johnstone … and David Beckham.